Roasted. Yes, that's right. 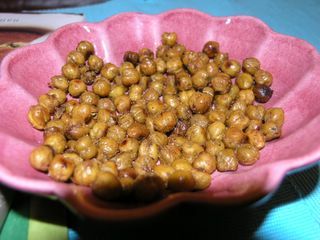 Roasted chickpeas. Who knew? Well, I read about this on Linda's blog quite a while ago, and filed it away in my mind as "well.. that's interesting. But as I generally can't stand chickpeas or beans, I doubt it." Saturday night, Lena and Nico came over for dinner and to watch the hockey game. (Miserable - Sweden lost.) Perfect time to try it out - and besides, there were plenty of chips and carrot sticks in case the chickpeas were nasty. As I suspected. But boy, was I wrong! These were great! Well, for chickpeas. They were a lot better than I would ever have expected, crunchy, tasty and very spicy. I changed things a little from Linda's version, so I'll reprint it here. Drain and rinse the chickpeas. Heat the oven to 225 degrees C. Put the chickpeas on a baking sheet, and roast for 20 minutes. Shake them a little bit half way through. Wow, Looks good. I usually buy them at an Indian grocery shop. Ready to eat, hot, spicy, crunchy chickpeas. Great snack food. Yum, I keep forgetting to try this recipe out. I'd love to try sprinkling a curry salt mixture on them. I'm so glad these worked out for you! I wasn't sure how good they'd be either the first time I made them, but they won me over instantly. Happy that you liked them too. Mcauliflower - curry salt sounds great! I got a yearning for a sweet version, I realise that it won't be as healthy but oh well. Maybe some brown sugar in addition to the spices next time! Linda - THANK YOU for posting these in the first place. Great recipe! Great recipe. Chickpeas are very common in Spanish recipes and we love the, but I've never tried them this way (I'll make it this evening). By the way, I have my own cokking weblog, but it is in Spanish (http://gourmetymerlin.blogspot.com) I'm sure you would like it if you could read it. Anyway, great recipe and great blog. Greetings from Santiago de Compostela. These are also excellent with smoked paprika (pimenton) and coarse salt. The only problem is that they're addictive! I made these for my birthday and they were a huge hit! Thanks for sharing.